One of the most popular minivans in the U.S. is getting a makeover as Honda unveils its 2018 Odyssey. The new van is sized similarly to the old one but wears new styling inside and out, features an interior that's just as versatile as the outgoing model, and has plenty of new electronics designed to keep families entertained. At first glance, the new Odyssey looks remarkably like the old one, with the same overall one-box shape, the familiar unusual kink to the beltline and similar triangular headlights. But a closer inspection reveals a much cleaner aesthetic to the new van, with more sculpting in the body sides, a front end that fits in well with the new Honda Pilot SUV and Ridgeline pickup truck, and a new roof design that makes it appear to be floating. The use of chrome and styling tricks make the new Odyssey look longer, lower and more athletic. LED taillights are standard while LED headlights are optional, and active grille shutters help improve aerodynamic efficiency when cruising. The Odyssey's occupant-friendly interior continues to please, with standard seating for eight people. New for 2018 is the Magic Slide second-row seat, which enables several different configurations thanks to a removable center seat and sliding outboard seats. The outboard left and right seats can be pushed together, moved apart or any combination in between. It's useful for providing easy access to the third row, affixing a child seat and sliding it forward for easy reach from the front seats, or for keeping quarreling siblings separated by a decent gap. The third row folds into the floor, but the second row does not. The electronics in the Odyssey have also been upgraded with a few new functions. Up front, a new Display Audio system is a far cry from the current multimedia morass, with clear, easy-to-use icons and excellent customizability. Unique to the Odyssey are CabinWatch and CabinTalk, two electronic systems meant to foster communication between and monitoring of passengers. CabinWatch uses a camera to let the front seat passengers see the rest of the passengers day or night on the optional 8-inch Display Audio screen on the dashboard. CabinTalk enables the driver to talk to the second- and third-row passengers using a built-in microphone and the speakers in the van. CabinControl is a new downloadable smartphone app that allows users to control various van systems using the phone, including climate control, the rear entertainment system and the navigation system; it also acts as a virtual jukebox that allows users to upload songs to a common vehicle playlist. In back, the new Connected Rear Entertainment System includes a ceiling-mounted 10.2-inch screen and plenty of vehicle-specific apps, and it can connect to the internet via built-in vehicle 4G LTE, public Wi-Fi or a cellphone data plan from a vehicle occupant. 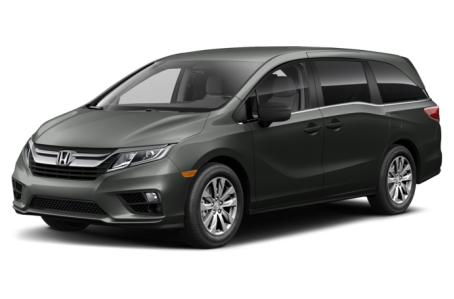 Powering the Odyssey is Honda's stalwart 3.5-liter V-6 engine making 280 hp and mated to either a standard nine-speed automatic or a new, Honda-engineered 10-speed auto in top trim levels. That's a 32-hp boost from the outgoing Odyssey and combined with the lighter weight of the new van, aerodynamic improvements and new transmissions, should boost fuel economy, though the EPA has yet to rate it. A new steering system is also included for fewer turns lock-to-lock, and additional body structure, door seal improvements and acoustic glass should make for a quieter Odyssey. The new Odyssey will continue to offer the Honda Sensing advanced safety package, featuring a host of new electronic safety systems. It will be standard on EX trim levels and above, which Honda says will comprise 95 percent of all Odysseys sold. It includes collision mitigation braking, lane keep assist, road departure mitigation, adaptive cruise control and more. Pricing for the new Odyssey will be announced closer to its on-sale date, expected to be sometime in the spring of 2017. 36 of 37 (97%) consumers said they would recommend this vehicle to a friend.